Microsoft has renamed its Windows Holographic ecosystem to Windows Mixed Reality, and the first development kits will start shipping out this month. 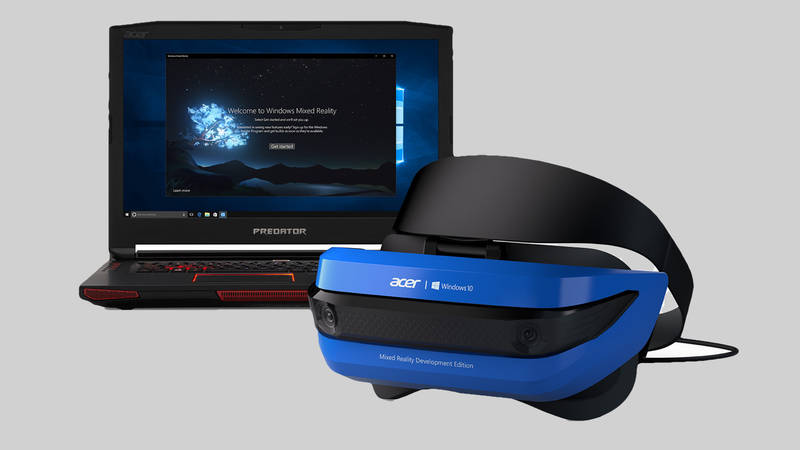 Acer is first out the gate, with its Developer Edition headset rolling out in the next few weeks. More will follow, and you can expect to start seeing consumer models priced from $299 shipping later this year. Microsoft announced last year that it was teaming up with a bunch of manufacturers including Acer, Dell, HP, Lenovo and Asus to build Windows 10 VR headsets, all of which would have inside-out movement tracking (so no need to set up other room sensors) and will make use of the camera passthrough for mixed reality features. Microsoft is essentially creating a half-way point between VR and HoloLens (which may have something to do with the rebrand), giving its headsets a different angle to the HTC Vive and Oculus Rift. They'll also be more affordable and require a bit less grunt power from your PC. Microsoft is firstly targeting Windows 10, but also confirmed that it's going to bring mixed reality to the Xbox One and Project Scorpio, the latter being the next Xbox console set to launch at the end of 2017. That means it'll be kind of going up against PS VR - "kind of" is because, again, the mixed reality part makes it a different proposal. It'll be interesting to see what that turns out to be.